The question of markets, and the means by which the State deals with them, is one of the most controversial issues to be dealt with in Egypt. Between demolition, regulation and rebuilding, the State remains unable to this day to find an appropriate means to deal with markets that on the one hand meets the State’s desire to legally regulate the affairs of vendors in markets, while at the same time maintaining the existing systems of buying and selling; such a means as would give the greatest benefit to vendors and respect the purchasing habits of buyers. Among the many attempts by the State to intervene in the regulation of markets – the large majority of which failed – we have identified a successful case, that of the market in Mīt `Uqba. This market provides an important example worth analyzing and comparing with other (failed) attempts in order to reflect on the factors of the success and failure of such markets. The site of the current Mīt `Uqba market has not changed much from its old location, which itself dates back decades. It used to be the case that vendors would spread their merchandise out for display on the ground in an empty patch of land, which has since been developed as the Mīt `Uqba Youth Center. The items for sale in the market vary, the vast majority of the market’s activity is dedicated to vegetables, fruits, meat and fish, while there are also vendors selling clothes, spices, and cleaning supplies, albeit in small numbers. In 1976, when the decision was taken to build the youth center, a wall was constructed to close off the plot of land, preventing the vendors from using it. At this point vendors began to arrange their goods around the perimeter of the wall, each one claiming a certain spot with the agreement of the others. This arrangement has since been consolidated and vendors have built huts from tin and other simple materials available to them in order to shelter and display their goods. In later years, the government began to regulate markets and bring them into a formal system within the State; in that period the vendors of Mīt `Uqba market, considered informal or unregistered, faced eviction and being driven off by municipal police. The situation remained this way until a decision was issued from the municipality to develop the Mīt `Uqba market by the year 2000. The idea arose when the director of the youth center filed a complaint with the district and the local council, expressing his dissatisfaction with the situation of the market. He saw that its “uncivilized” condition and the inappropriateness of such a situation, being so near to the youth center, would harm the image of the center and the neighborhood. The administration of the municipality and the local council began procedures for regulating the vending within the market and the development of the market itself. Instead of removing the vendors and moving them to another pace, the decision was taken to keep the vendors in their place and improve the state of the existing market. Building on this, the local administration sent a sketch to all the vendors of the planned design to be implemented for improving the market stalls. The local administration also stipulated that they should complete the redevelopment work within a specific time frame in order to continue selling in the market, otherwise they would be removed. The design for the stalls consisted of building two building two brick walls of specific size and height, with a tile cladding and concrete ceiling. It was agreed that these stalls would be built in the same site occupied by the original vendors, along the wall of the youth center. The vendors together agreed to participate in implementation of the work required by the municipality. Groups were formed between five to six vendors each that would enter into agreement with a contractor to carry out the building of the stalls and pour the concrete ceiling across them at the same time in order to reduce the cost. The vendors carried all the costs of construction themselves; as one vendor notes, these stalls cost roughly 1000 EGP each, and many of the vendors were forced to borrow in order to pay such an amount. 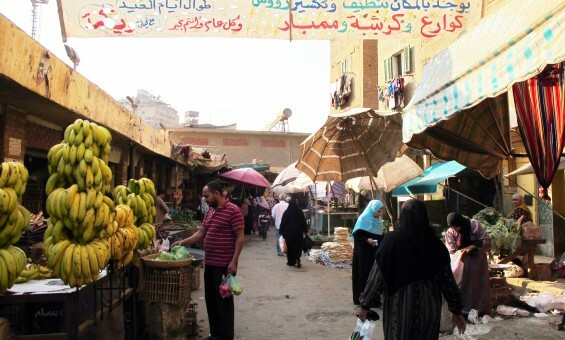 After their situation was legalized, the vendors became tenants of the stalls, renting them from the municipality and paying an annual license fee of approximately 300 EGP, in addition to the monthly rent of 41 pounds, a small amount compared to rental units in other markets such as that in Būlāq Abū al-`Ilā, which ranges from 90-110 EGP per stall. There were 187 units built in Mīt `Uqba, and we found over the course of several visits that the majority were open and in use. Since the establishment of the new stalls, vendors have been waiting for the government to provide them with electricity, and they have even made several applications for electricity connection to no avail. Some were forced to connect electricity from buildings opposite to the market and pay a share of the building’s consumption with residents, which in the end makes vendors pay for more than they actually consume. When questioned on this, one of the municipal officials confirmed that there was a project in place to connect electricity to the market which would be completed very soon. An agreement has been reached with the electricity company and a quote has been sent to all the tenants requiring them to pay 590 EGP each by 2013 for the work to be done. As was noted by several members of the Mīt `Uqba Popular Committee, they are following up with responsible authorities until the process of bringing electricity to the market is actually completed, because of the importance of this step to the vendors. Unlike many, if not all, of the cases where the government has intervened to organize markets, the traffic scheme and movement of goods in the Mīt `Uqba market has not been negatively affected after its organization. In contrast, the Būlāq Abū al-`Ilā market was rebuilt by the municipal administration with a new, different design. Contrary to the desired results, the Būlāq market was abandoned by vendors because the new closed design killed their sales, as it prevented interaction with buyers and passersby on the street. In the case of the Mīt `Uqba market, according to several people interviewed, we find that the overall situation improved after construction of the stalls, from an environmental, sanitary and aesthetic perspective. However, many of the vendors complain that the construction of the 26 July highway axis split the neighborhood in half, leading to a lower turnout in the market, especially from people in neighboring areas such as Muhandisīn. It used to be the case that residents of (wealthier) neighboring areas used to buy goods in Mīt `Uqba due to the lower prices and higher quality of its goods, particularly fruits and vegetables. However, due to the distance and the need now to cross a pedestrian bridge over the highway to reach the market, demand has dropped. The decision to develop the market instead of moving it and removing the vendors from their place helped to protect the original vendors. The majority of those who sell in the market are long-term residents of Mīt `Uqba and many were born and raised in the neighborhood, and have been working their whole lives in this market. These original vendors, because of the planned development process, were able to be given priority in the new rental units. This made a significant social impact, specifically in an area like Mīt `Uqba, where the vendors are connected to the neighborhood through strong social and economic ties, and their community networks and work in an area they are connected to are the only means they have to meet the burdens of living. In several attempts by the government to develop markets there was a great deal of waste caused by removing existing markets and subsequently building entirely new markets to house vendors. This was the case, for example, in the Būlāq Abū al-`Ilā market which sellers could not stay in after its construction because it proved to be completely inappropriate to their needs, resulting in the waste of all the money that had been spent on the project. With the Mīt `Uqba market, however, the project avoided high expenditures and potential waste of public funds by limiting the role of the local administration to regulatory behaviors and supplying architectural designs to outline the base of the redevelopment process. The administration subsequently relied on people’s own self organization for the actual implementation. Surely, on the other hand, this does represent a greater burden on some of the vendors who may not possess the resources to implement the area plan, and may have caused some vendors to leave their place in the market and look for another place to display their goods. As such this arrangement requires greater attention from implementing bodies to study the social situation of vendors and take their individual situations into account, as well as greater flexibility in order to achieve equality and just treatment for all. The market is now subject to the administration of the `Agūza municipality, which has a department that specifically deals with markets, but in fact it is the vendors themselves who carry the responsibility of maintenance and cleaning, doing so at their own expense. The environmental quality in the market improved after the construction of the new stalls; the market became cleaner, more streamlined and less susceptible to contamination and waste. it is worth mentioning that the vendors are managing sanitation themselves, and organizing trash collection without any direct support from the municipality, and that in many cases they hire ordinary people from the neighborhood for transporting their trash in exchange for a small fee. Despite the efforts of vendors, however, the Mīt `Uqba market, like the vast majority of Egyptian markets, lacks an integrated environmental system to deal with the different types of waste produced by such markets. The State continues to search for solutions and mechanisms to deal with informal markets in the majority of neighborhoods, whether urban or rural. There does not seem to be any specific mechanism followed and replicated to deal with these markets and how to develop them. The study and analysis of the Mīt `Uqba market and similar examples may prove beneficial in this regard when thinking about future market development projects. The primary factor in analyzing such experiments must be monitoring the degree and nature of State intervention in the course of attempting to regulate such markets, asking in particular whether State intervention was in an implementing role or merely procedural, and if so to what extent. Also, the Mīt `Uqba market has another dimension of interest related to the social, cultural, and economic situations of vendors and users of markets; this implicates a question of design as well, which directly implicates the efficiency of markets and their optimal use. However, in the absence of real analysis of such cases, it is both difficult to repeat successes or avoid failures in other situations where the State intervenes. At first glance, it may seem that the current situation of the Mīt `Uqba market is completely normal, and not particularly striking, but we cannot analyze the aspects of the project that distinguish it from its counterparts without considering its own history and redevelopment. Also, there is no way to understand and benefit from it without studying the comparative experiences of other popular markets, where regulation has taken the path of a complete redesign. In most of these cases, one sees the redevelopment or relocation of the market without paying attention to the social and cultural factors that play into practices of buying and selling, nor have any behavioral studies been done of existing market practices before operations to redevelop, redesign or relocate the markets. Such redesigns do not take into account the efficiency of paths of movement through the markets in new designs that would allow all vendors an equal opportunity for their goods to be seen by shoppers, nor the functional and environmental aspects related to providing services such as clean restrooms for vendors and shoppers, access to decent storage to prevent damage to goods, or sanitation services to manage the various waste produced by the markets. These government markets miss aspects of community organization that allow for associations or unions between vendors that would protect their rights and provide them with the necessary support when needed. All of the above form essential design and organizational criteria to be taken into account in any commercial facilities, whether they are popular markets or modern shopping malls. As an example of the flaws of design and management of markets in Egypt, the Būlāq Abū al-`Ilā market redevelopment done by the Cairo Governorate in Būlāq street cost hundreds of thousands of pounds, on land in the heart of one of the most prosperous commercial areas in Cairo. Nevertheless, this new market design failed to provide paths through the market that would give equal opportunity for all vendors to display their goods, and furthermore also closed off the market from its surroundings, an active commercial area that revolves around the street and connection to the many street vendors outside. The design implemented went against the customary organization and orientation of traditional and popular markets toward the street, which gives vendors and visitors a sense of continuity of the market with the street, giving buyers an opportunity to pass the majority of stalls by simply walking along the street. As a result of these failures to consider and take into account such practices and existing organizations, the vendors fled the new market and returned to peddling their goods on the street, where buying and selling was more popular. Currently, most of the shops in the new market are now closed, the vast public funds spent on the project are effectively wasted, and this vast empty space has made the rest of the neighborhood much more congested. Here we come to the most important issue: namely, the degree of State intervention in the regulation of markets or urbanism as a whole. The state of the Būlāq Abū al-`Ilā market compared to the Mīt `Uqba market shows two contrasting roles that the State can play in this area. In the former case, the State came up with an effectively imaginary idea of what a model market should be, in terms of legal status, organization or design; this is what happens in most cases, without any consultation of the parties connected, whether buyers or sellers. Nor did the State stop here, but undertook implementation of this abstract vision and spent our money on it to build it in its entirety. In the latter case of Mīt `Uqba, however, the State limited its role to providing technical and administrative support, trying to simply regulate a situation which had been in place for decades already and accept it as a successful market environment pleasing to buyers and sellers alike. Whether as the result of conscious decision or happy accident for the Mīt `Uqba market, officials decided to preserve both the location and configuration of the existing market. It may be that this decision was made due to the small area taken up by the market, or lack of resources to make a new market, which is not uncommon, or perhaps it was due to public and political pressure to keep the vendors in the existing market. Regardless of the reason, the result was that officials did not try to reinvent the wheel and impose their own vision of how to organize a market, and they delegated implementation to residents and vendors themselves, who cooperated with one another to complete the task efficiently and at far less cost than any comparable government intervention. Here, perhaps, lies one of the secrets of success and sustainability of this approach: it respects the already existing situation and benefits from the accumulated experiences of the community, building on community social and economic assets and adds to them to them, rather than ignoring and squandering them as we have seen in many other cases. Vendors who have been working for years in the Mīt `Uqba market were the ones who were most capable in arranging, managing, and running the market, based on their experience and knowledge of the requirements of their work. Each and every day people are proving that they are the most familiar with what suits them, and they are the most creative and able to deliver successful solutions to their various problems. This fact is not confined to the Mīt `Uqba market, or even the regulation and creation of markets as a whole, but extends to many aspects of urban administration through Egypt’s different cities. It may be better in many cases that the State abandons its grandiose ambitions to reorganize the ways that we go about our daily lives into something it deems more appropriate. Perhaps it may be enough that the State provides technical support and legal and regulatory frameworks that facilitate the various aspects of our lives, instead of imposing unrealistic solutions on us, that this may be the best point of entry to improving our existing cities.